I know what I'm about to write isn't going to go down too well with some people, but hear me out. Feminism has done a lot to provide freedom of choice for women and that's something, as a woman, that I'm very grateful for. However in the process we seem to have got stuck in the mindset that women and men are equal and to me this is a great shame. In both eastern and western philosophical traditions we encounter metaphors for masculine and feminine energies in their most elemental form. 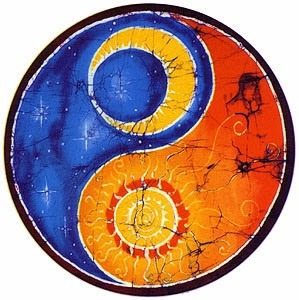 In the east we have the receptive and inward going Yin balanced by the active, forceful Yang. In the west the nurturing, life-giving elements of Earth and Water are representative of the feminine, while the more active elements of Fire and Air represent the outward going force of masculinity. In both traditions we see depictions of gender balance, rather than gender equality. For me, gender balance creates a harmonious way of relating where both parties are supported by the other. It does not mean that the woman no longer expresses the creative and active elements of her personality or the man his inner feminine qualities. Remember the Yin-Yang symbol: each element contains a little of the other. However, in our culture women are no longer Yin with a little Yang; instead, most of us are full on Yang, pushed by financial circumstances or our own drive to prove ourselves into a manic, stressful busyness that leaves us depleted and irritable. Too often we no longer have time to nurture and support our loved ones. In a partnership based on gender balance the man's natural inclination to be assertive, decisive and goal-oriented can manifest more productively with the gentle encouragement, faith and trust of his partner, while the woman's gifts of inner knowing, intuition and nurturing are able to come to the fore when she is not so caught up in the outer world of action and accomplishment. Now some will no doubt feel ill-at-ease about the words I'm using here. Am I advocating a return to a co-dependent state where the woman is reliant on the man to protect and provide for her? Well my answer to that is 'hell no!' There is no point, or even possibility, in going backwards here. What I'm talking about is a natural transition. We women were unhappy and oppressed being dependent and so we've worked hard to become independent. However as an ecologist I know that independence is an illusion. In nature interdependence is the natural way, and as we too are a part of nature this is also a healthy state for us. Nature also teaches that the greater the diversity within a system the more stable and resilient it will be. When women strive to become like men we lose diversity and that means less stability and resilience in relationships, families and communities. This is because two beings of the same kind must compete to survive, and this creates power struggle and conflict. The concept of gender equality is a hard one to let go of, particularly for women but for many men too. This is because it feels like we are going to lose our power, however I believe this is an illusion. Our culture has forgotten the true strength of the divine feminine, a strength so different from the masculine power we are taught to strive for. While the masculine pushes, climbs, acts, fights, the feminine supports, contains, gives sustenance. The Yin is the source of intuitive knowing, of wisdom and of the true strength which arises from gentleness and humility. My journey toward this way of thinking began with the books of David Deida. He's written many books but one of my favourites is Intimate Communion: Awakening Your Sexual Essence. It's good one to start with if you're interested. I suggest one caveat here: some women are born very Yang and some men very Yin. This can usually be seen very clearly in their natal astrology chart where there will be a predominance of planets placed in Masculine or Feminine signs. However even in these cases I believe the principles I am discussing here remain the same. I for one am enjoying rediscovering the power of the feminine. Perhaps you are too... If so please share your experiences. I suppose my having read at least one of the books you've read, has led us to similar conclusions! You do bring out the biggest words in me Faith. Miss you heaps. This makes a lot of sense to me. I worked for years in a high pressure job until I literally burnt out from exhaustion. Now I am trying to reclaim a quieter way of being. Thanks for the post!